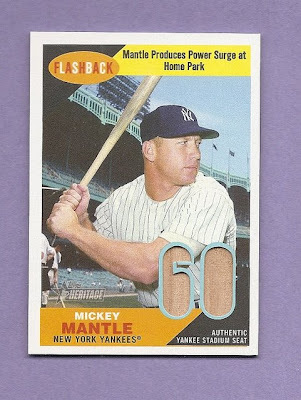 Stoney over on the PSA boards pulled a nice 2009 Mickey Mantle seat relic card. Someone else over there pulled another Mantle seat relic card last night, but it was a different card! So there are at least two different Mantle seat relic cards. 2009 Topps Heritage is Alive!!!!! !